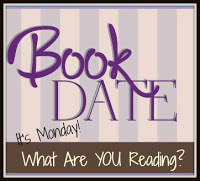 Book By Book: It's Monday 1/8! What Are You Reading? Whew, this week passed in a blur. What I thought was bronchitis turned out to be that plus a really nasty virus, so I was down for 10 days total, though only completely non-functional for three of those days. I left the house this morning for the first time in 10 days - woohoo! I finally turned the corner yesterday and am feeling much better, though a bit stunned by the long list of stuff I intended to do last week that didn't get done! And now my husband has this virus - he's home from work today. I finished Only Child by Rhiannon Navin, a debut novel due out February 6 that I reviewed for Shelf Awareness. It's about a school shooting and its aftermath from the perspective of a six-year old boy named Zach. It is gripping and powerful - seeing these events and people's reactions through the eyes of a child is truly remarkable. Though he is confused and grieving himself, Zach somehow manages to bring his parents out of the depths of despair - this novel was SO good! I'll share my review as soon as it is published. Next, I read a novel that was on many Best of 2017 lists: Exit West by Mohsin Hamid. Wow, this was another amazing novel! Good start to the new year. This is a hard one to describe: it's a quiet, gentle story that follows both the evolution of a relationship and the evolution of a new world. The new world comes about because of the sudden appearance of mysterious doors that allow people to instantly move from one place to another, forever changing the meaning of immigration. It's a moving and thought-provoking book. I almost forgot - I also finished a nonfiction book I started in the fall: The Adrenal Reset Diet: Strategically Cycle Carbs and Proteins to Lose Weight, Balance Hormones, and Move from Stressed to Thriving by Dr. Alan Christianson. A friend of mine who has the same disease as me (ME/CFS, an immune disorder) said this book helped her. Some interesting science here, but I already eat pretty much this way, so maybe just a few minor tweaks I can try. Now, I am reading a new YA novel, The Pirates of Cologne by Dinah R. Mack (the friend of a friend). It's about a group of teen boys in Cologne, Germany, in 1942 who are part of the Edleweiss Pirates, resisting Hitler in their own ways. I just started it last night, but it's already interesting and engaging. And I am reading a middle-grade graphic novel on the side, Cici's Journal: The Adventures of a Writer-in-Training by Joris Chamblain and illustrator Aurelie Neyret. CiCi is a budding journalist who investigates a local mystery. It's warm and fun so far. I started my first audiobook of 2018: Perfect Little World by Kevin Wilson, an adult novel. It's about an 19-year old girl who is pregnant and joins a strange sort of Utopia experiment, where a group of parents and babies all live together and bring up their children together, with the kids not knowing who their parents are until age 5. Yeah, it sounds a little weird, but it's intriguing so far. Our son, Jamie, 23, finished one of the hefty fantasy novels we gave him for Christmas, Dawn of Wonder by Jonathan Renshaw, book 1 in The Wakening series. He loved it and read its 700+ pages in a week! (again, the plus side of a sick week). He's been at his apartment all week, so I'm not sure what he's reading now - something on his Kindle, I think - but the boxes from Amazon addressed to him are piling up here, so I think he's been spending his holiday gift cards on more books! Last week's blog posts - catching up! Movie Monday: Star Wars: The Last Jedi, an excellent addition to the canon! You've managed to get through a lot despite a really sick week. Hope you continue to improve. I am adding Only Child to my (ever-growing) TBR list. I have found myself reading WWII resistance novels lately so I'm glad to hear of another good one. Sorry you have had to weather such a health storm and now your hubby as well. Just read your Artemis review and was delighted to see it so positive, its one I want to read but saw a few poor reviews but I did love The Martian. Oh, I'm surprised to see that - I hopped over to Amazon to ck out some of the negative reviews. I enjoyed it and so did my husband - I think it's very similar to The Martian in tone and style. I've been meaning to read Exit West for the longest time - been down with coughs and colds too after Christmas and lasted til after the New Year - there seems to be a bug going around. Have a great reading year! Oh, yeah, some nasty stuff this time of year - hope you are feeling better now! I agree that Exit West is a powerful novel. That 'thing' that is going around is just nasty. Thankfully I had my flu shot so it didn't move into my chest. I still ended up with a secondary infection and found reading or listening to books impossible. Sorry to hear you were so sick, too! Hope you are feeling better now!